In Part III, we explored the organizing effort of the Grand Rapids chapter of Women in Black and the local news media’s reaction to the Colin Powell presentation at the UN on WMDs, in early February of 2003. Part IV focused on student anti-war organizing and an action that took place at Congressman Ehlers office, resulting in several arrests. 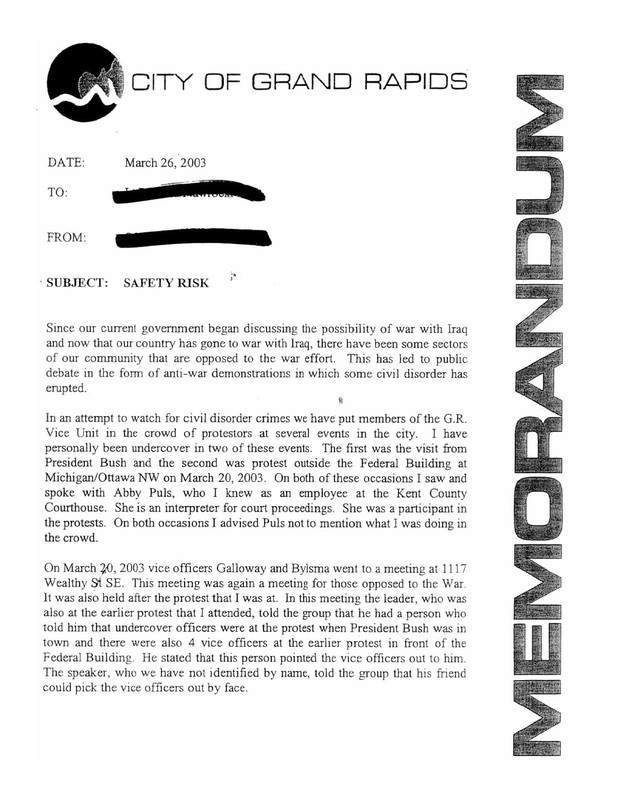 Part V in this series, we looked at the GRPD’s efforts to monitor and infiltrate anti-Iraq war efforts and the protest that took place on the first day of the US invasion of Iraq. 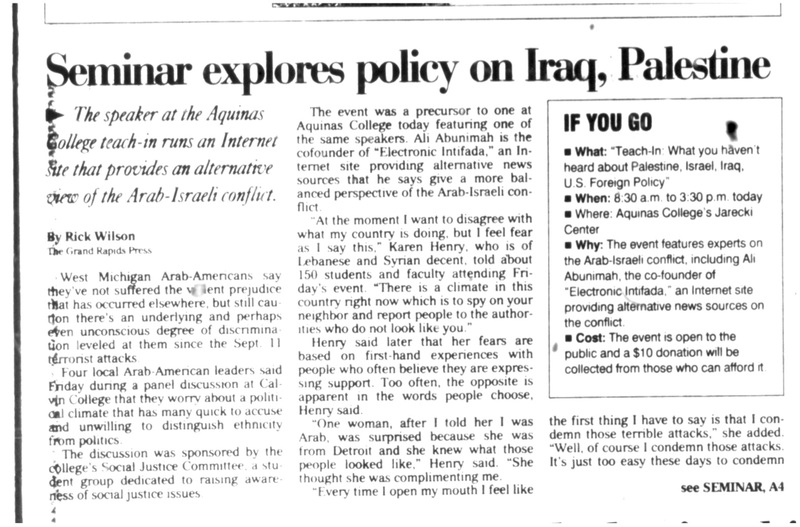 In today’s post we look at local media reporting on the US war in Iraq and how one radio station was overtly promoting the war. Just weeks after the US invasion and occupation of Iraq began, some involved in anti-war organizing decided to challenge the local media with their hyper-nationalistic reporting and cheerleading. The Grand Rapids Institute for Information Democracy (GRIID) also conducted a six-week study of the Grand Rapids Press and the three TV news stations (WZZM, WXMI and WOODTV8) from a few days before the war began (March 17) through the first full week in May. The GRIID study looked at sources, framing, historical context and home-front coverage. 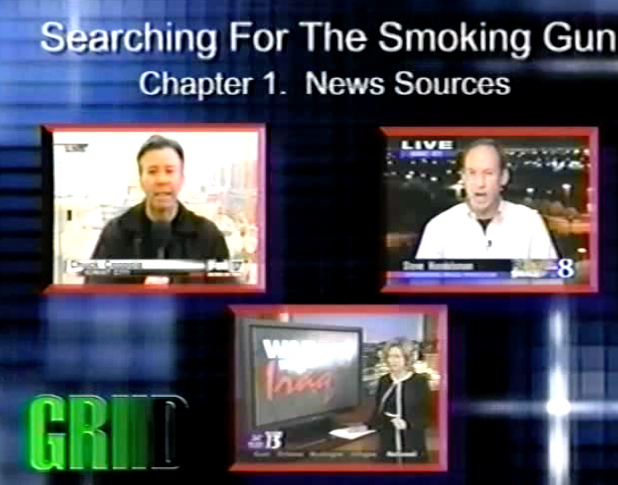 You can view a 38 minute video analysis of their study, Searching for the Smoking Gun: Local Coverage of the War in Iraq. In Part III, we explored the organizing effort of the Grand Rapids chapter of Women in Black and the local news media’s reaction to the Colin Powell presentation at the UN on WMDs, in early February of 2003. 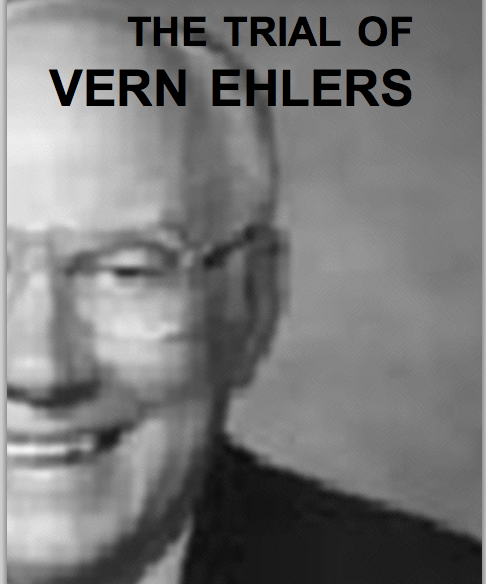 Part IV focused on student anti-war organizing and an action that took place at Congressman Ehlers office, resulting in several arrests. 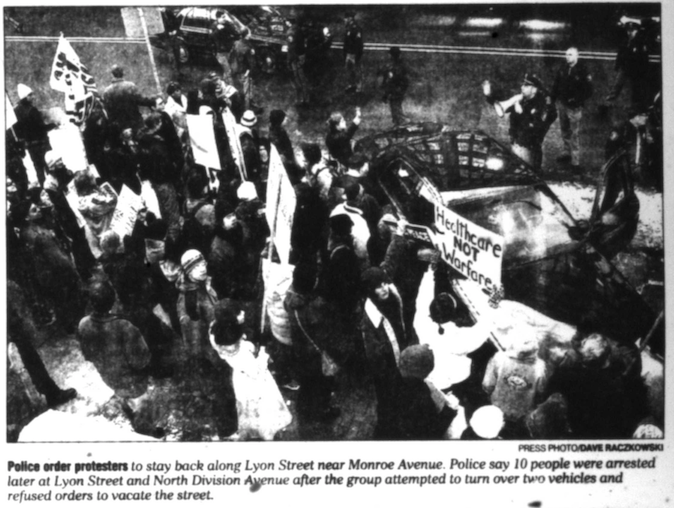 Today, we want to look at the GRPD’s efforts to monitor and infiltrate anti-Iraq war efforts and the protest that took place on the first day of the US invasion of Iraq. 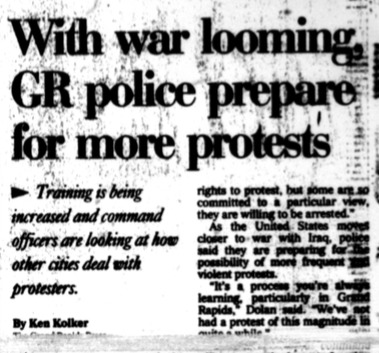 The Grand Rapids Press ran an article just prior to the beginning of the war, headlined, “With War looming, GR police prepare for more protests. 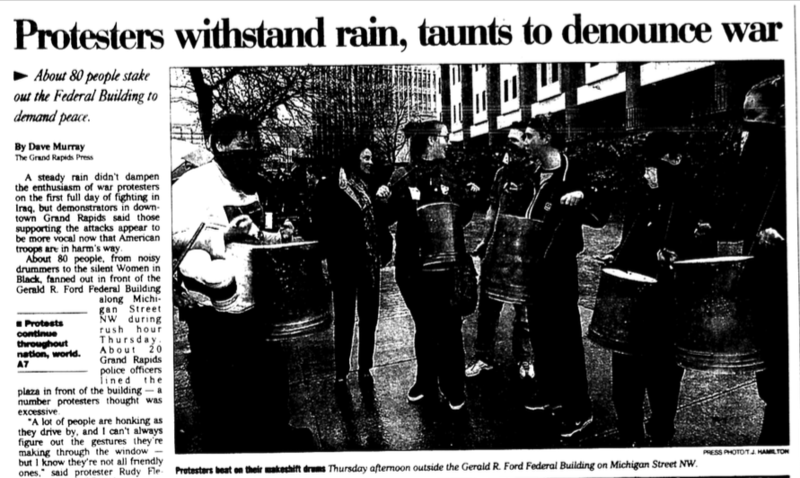 The Press article conveys that the GRPD was planning on stepping up their activities and training in preparation for demonstrations. What the GR Press article does not discuss is the fact that the GRPD was monitoring the e-mail communications amongst anti-war organizers and sending undercover officers to meetings and protests. We know this because organizers worked with the ACLU to obtain GRPD documents related to the anti-war movement in Grand Rapids. The flyer on the right was a flyer that was created by organizers, but this copy was obtained through an ACLU FOIA request. 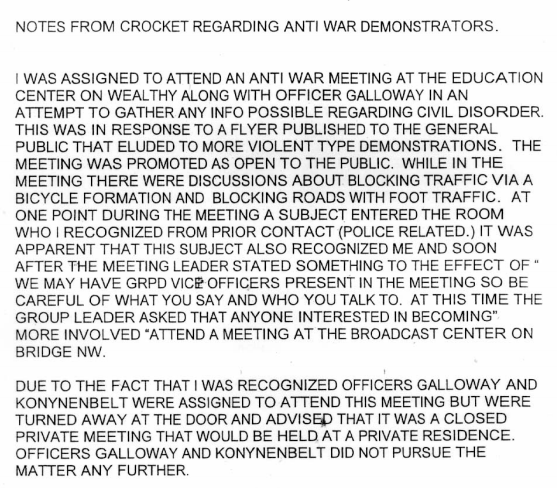 The document below is from the GRPD, acknowledging that they sent undercover officers to anti-war organizing meetings, even though the undercover cops were exposed. The first part of the document discussing coming to a meeting at the IGE office on Wealthy St, then references to a meeting held at the Community Media Center on Bridge St. a few days later, where undercover cops were denied entry to the building. 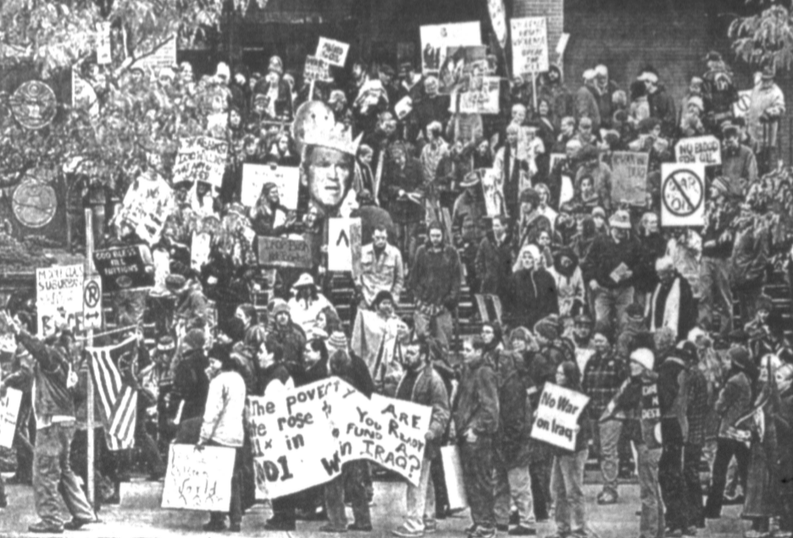 The first demonstration that took place in Grand Rapids, once the US invasion of Iraq had begun was reported on by the Grand Rapids Press. The story is rather superficial and ignores the fact that the GRPD had undercover cops in the crowd of protestors. Those involved in organizing the protest were alerted to two guys who were undercover cops, by someone who participated in the demonstration. She was able to ID the cops because she was a translator at the local courthouse and knew lots of the police officers while translating for people who had been in court and seeing the same officers in uniform there to testify against people who had been charged. 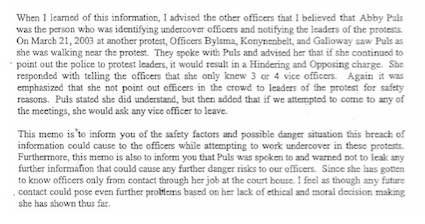 Below is another document about the woman who had identified the undercover cops and shared that information with organizers. The GRPD states, “any future contact could pose even further problems based on her lack of ethical and moral decision making she has shown thus far.” Here the GRPD demonstrates their arrogance and the belief that they were right to infiltrate the protests. For many people, this was the first time they had encountered police as infiltrators. Some were surprised that the GRPD would engage in these kinds of tactics, which was really a reflection on how limited people’s understanding was on the history of police infiltration of social movements. 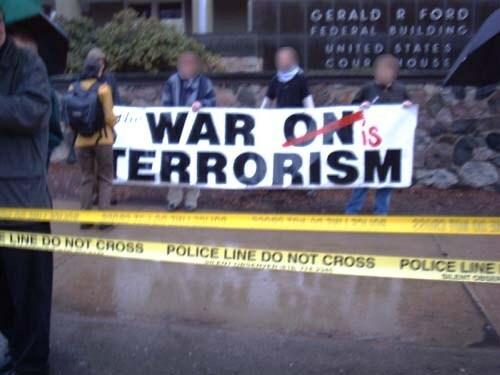 The result of the GRPD intimidation and infiltration meant that some people chose to not participate in any further anti-war actions, while other people chose to distance themselves from those who had been the primary organizing entities in 2002 and 2003. To view additional documents that were obtain by the ACLU, go to this page on Media Mouse. 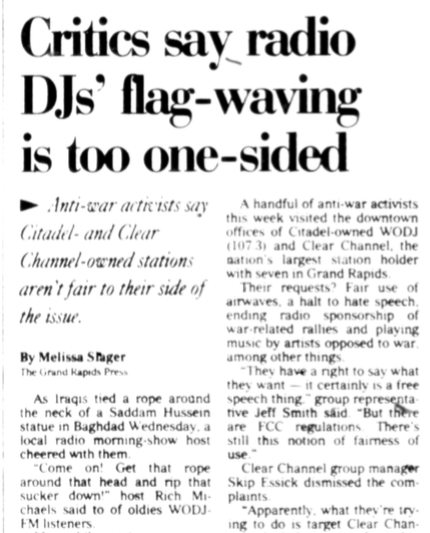 Two weeks ago, we posted Part I of this series on anti-Iraq war organizing in Grand Rapids. Part I dealt with the beginning actions against the build-up to the war, specifically in the fall of 2002. 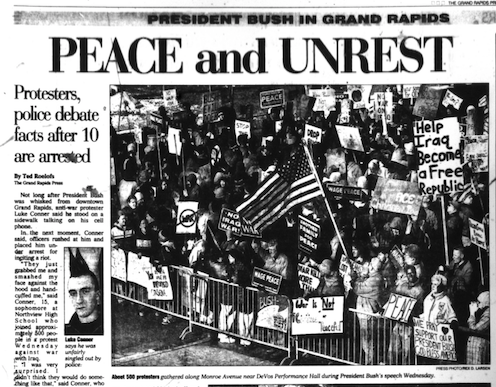 Today, we will focus on the continued resistance at the beginning of 2003, including the demonstration that took place when President Bush came to Grand Rapids the day after his State of the Union address. Just prior to the Martin Luther King Jr. holiday in mid-January, there was an indoor rally held at Plymouth Congregational UCC in Grand Rapids, which included speakers and a send-off for people who were making the trip to Washington, DC for an anti-war march on MLK Day. The People’s Alliance for Justice and Change were hosting ongoing organizing meetings in preparation for the US invasion/war against Iraq. The meetings were held in numerous locations, but organizers began noticing that there were both GRPD cruisers parked nearby meeting spaces and on several occasions undercover officers attempted to come to the meetings. Organizers were able to spot them and denied them entry into the spaces were the meetings were being held. Then, it was announced that President George W. Bush was coming to Grand Rapids, the day after his State of the Union address. Organizers began planning an action to confront Bush when he would be in town. The announcement said he would first be at Spectrum Hospital and then take the motorcade to DeVos Hall. The plan was to line up on both sides of Michigan Street, from just west of Spectrum Hospital, all the way down to the Federal building. The GRPD was told that the demonstration would then move down Michigan Street and turn left onto Monroe. However, organizers had a different plan, which was to turn left on Ottawa, then right on Lyon St and go directly to DeVos Hall. Jack Prince, who was teaching at GVSU at the time, and was at the protest, told us what had happened to him that day. 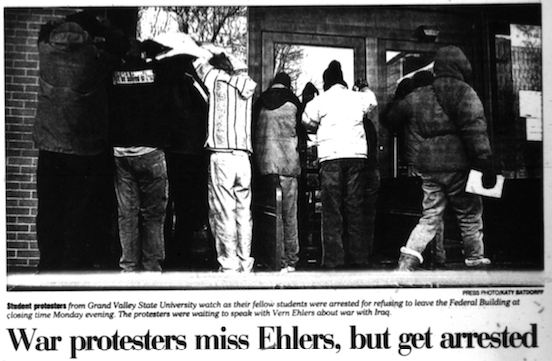 The protest in 2003 had problems from the beginning. All of the phones were shut off in the sociology and psychology department on campus as a means to thwart communication, since they knew there was talk of organizing or even discussing Bush’s visit. This was denied later, obviously. The group I was in was detained on North side of Michigan Ave in attempt to separate us from other protestors by police. After complaints we had to travel down Michigan to a point to cross. We noticed a lot of plain clothes men in suits with earplugs that were directing the local police as to what to do with shades on and dress suits. They would not interact with us and tried to be invisible but they were clearly in authority and control. As we proceeded down Ottawa south they attempted to compact us on sidewalk and when we turned West on Lyon there they had a constricted area where they made their move and began grabbing people. My daughter was grabbed and thrown on top of the hood of a car and was arrested. I became very vocal obviously at that point toward the police, but as there was a crowd forming with more witnesses they didn’t arrest me until I was walking up the steps to the ground level of a second story level by what is now the 5/3 bank building. Again in an area that was blocked from vision. My charge was: instigating a riot. A serious Felony Charge. People at GVSU, meaning the administration higher ups, saw me with a GVSU coat I had on in the news coverage and I was contacted by the Coaching department and they shared their displeasure which led to my departure from the school. After some time and organization with others who were arrested the charges were dropped. The ACLU was helping us and and really were instrumental in the charges being dropped after approximately a month. In addition to the few who were arrested on Lyon Street, there was a whole other group that chose not to march down to the Free Speech Zone and began marching in the streets through downtown Grand Rapids. The GRPD began arresting people for marching in the street and an estimated 17 people in all were arrested that day. However, as Jack Prince shared in his story, ACLU lawyers got involved and most people had the charges dropped. Those who did not have their charges dropped were ultimately charged with misdemeanors. 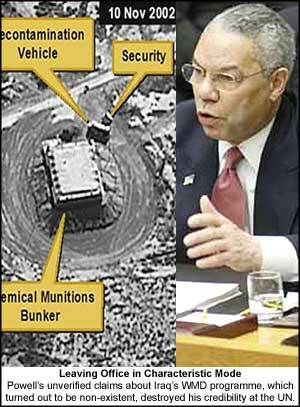 In Part III, we will explore other actions that took place in Grand Rapids prior to the US invasion of Iraq. 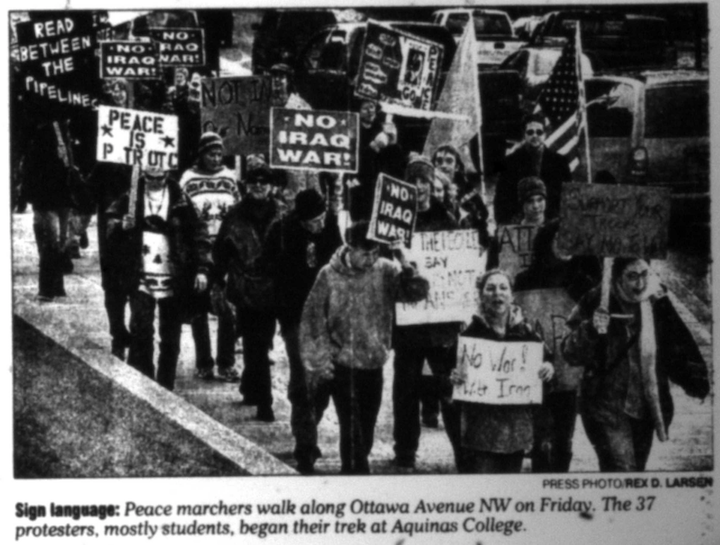 Recently, we posted a piece about the Anti-Afghan war organizing that took place in Grand Rapids in 2001 – 2002. Part of that organizing grew out of a Teach-In that took place just weeks after the 9/11 attacks, in early October of 2001. One year later, a second Teach-In was held, this time focusing on Israel/Palestine and Iraq. The last session at the Teach-In was devoted to discussing plans to mobilizing resistance to a US military build-up against Iraq. People came together for meetings to oppose the war in Iraq in the next few weeks and organized the first protest against the US threat of war against Iraq near the end of October. The protest consisted of a rally that started at Veteran’s Park in downtown Grand Rapids, where a few people spoke, mainly to get the crowd of 400 people fired up. The crowd then marched through downtown Grand Rapids, without a permit, with part of the march taking place in the streets. The 400 marchers then went to the Gerald R. Ford Federal Building, where they occupied the steps in front of the building. A few more people spoke and shared information about next steps in the campaign to prevent a war with Iraq. The 400 marchers was the largest anti-war march in Grand Rapids since the Vietnam war, yet this resistance would only grow in size and intensity in the coming months. The march had been organized by the People’s Alliance for Justice & Change. 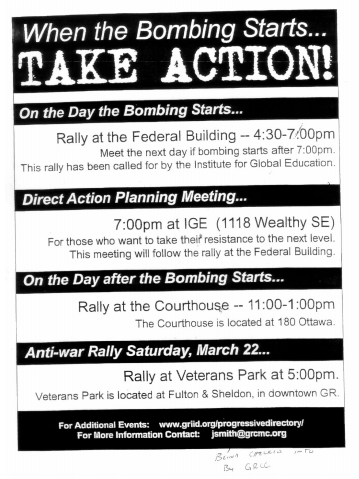 In Part II of this series we will look at the next phase of anti-war planning in Grand Rapids, including the protest that greeted George W. Bush when he came to town in later January of 2003. 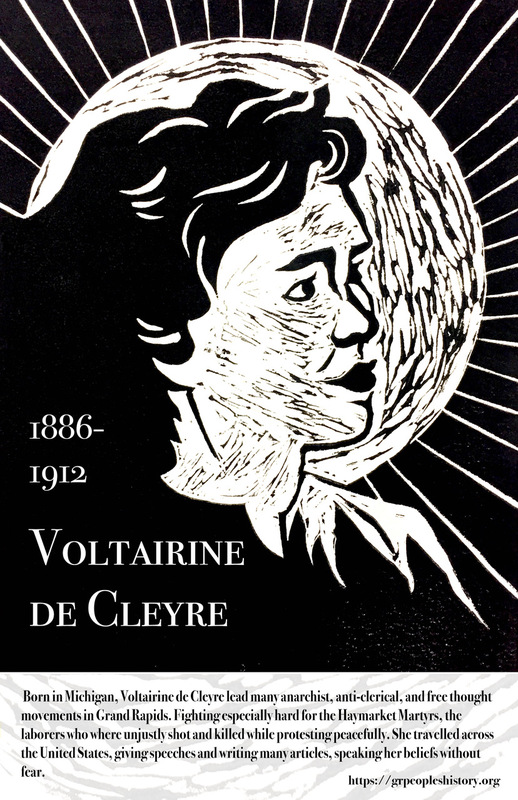 This new print, created by GVSU student Katie Los, celebrates the life of American anarchist Voltairine De Cleyre. In the early 1880s she moved to Grand Rapids and was active in the anti-clerical, Free Thought Movement. Voltairine soon began writing for various publications and exploring other political disciplines. However, it was the Haymarket uprising in Chicago in 1886 that finally brought her to embrace anarchism. More specifically, it was the hanging of the Haymarket Martyrs in 1887, that solidified her belief and commitment in political anarchism. De Cleyre wrote about numerous other topics, including the Mexican Revolution. She died in 1912, at the young age of 46. However, despite her short life, she not only impacted those who heard her speeches, she continues to inspire generations of people who will consecrate their service to the world! For more information about De Cleyre’s life and her writing, see our original post from 2016.